I want to develop some new sewing habits. I don’t throw away old used sewing needles (always forget). I don’t get rid of scraps I’ll never use (hoarding). I don’t clean up my workspace when I’m done (lazy). I don’t cut my threads off as I sew all the time (see above). I buy far more fabric than I can reasonably use sometimes (don’t we all?). But changing my behavior has been hard, because these are old habits and you know what they say about old habits. But I have a good idea for breaking some of these, and you can try it with me if you want. It’s actually super simple. I first read about this idea on Zen Habits, and just this week I heard a psychologist on NPR talking about how effective it is. The big idea? Make changes by doing as little as possible. Instead of thinking about all of the habits you need to change and half-heartedly committing to all of them, you focus on one small habit every month. Just that one, and don’t worry about changing anything else. By spending a whole month concentrating on one habit, you actually remember to put it into practice. By the end of the month, the new habit is second nature and you can move on to the next one. This idea of doing the bare minimum appealed to my lazy side, so I tried it out. For the first month, I tried eating a salad every day in order to get more raw veggies in my diet. It really did become second nature, and I’ve been eating way more salad ever since. Then I put two and two together and thought, what if we applied this to sewing? I bet we could do it together and break some of those less-than-optimal habits that we get into. You know, leaving your workspace a mess, or forgetting to prewash fabric… whatever it is you’d like to change but just can’t. Every month, I’ll post my own good habit of the month. That will be the thing that I, personally, will be working on that month. Anyone who wants to join me in that habit can, OR comment with their own habit for that month. What do you think? One more thing. I find it helpful to phrase these as good habits you can practice regularly for a month (and beyond), rather than vague things you’d like to change. Make them concrete. So instead of “buy less fabric” or “use my stash” I might say “For every project I buy fabric for, sew one project using supplies from my stash.” It’s helpful if you can ask yourself “Did I do this?” and be able to clearly answer yes or no. I’d love to hear from you in the comments about what habits you’d like to start or break when it comes to sewing. Maybe it will give others some ideas too! Good habit of the month: Clip those threads! This is fabulous!!!! I would love to follow this… interesting about the salad… what I try to do is sew some, exercise some, clean the house some, garden some during the day. I also buy too much fabric. I am not talking about large pieces that you could actually make into something. I keep buying fat quarters. (Those clever marketers know how to get me!) I do quilt as well as sew clothes but really there is never enough to actually make anything unless you want a really scrappy look (which I don’t always). I’m really quilty of buying fabric for a project and then buying more for another project before I even complete the first one. It is an addiction. I find I enjoy planning for a project just as much as I do sewing it…maybe even more? I am good at cleaning up my workspace. However, I’m really bad about changing my sewing needle out for a different type of fabric. I lay that sewing needle on my table and then forget what type of needle it is and then have to toss it. This is what I need to work on. I think I need some kind of needle storage to label types by for safe keeping. I don’t want to add it back into the unused ones though. To store used, but still good needles, I made a needle cushion. It is quite large – 4 inches square with areas labelled for the different types of needle I use. This needle cushion came about when I saw a similar design in one of the old “Zigzag” magazines published by Husqvarna. Not having an embroidery machine, which the design had been written for, I made my own. I’ve used it for a number of years now. OH that is SUCH a good idea! I keep trying to remember what needle I’ve used, even with a “needle marker” it never seems to work and sometimes I put them back in a case, but again, who knows which are used or not????!!!!! A marked pin cushion for the used ones? HOW BRILLIANT! and duh, why didn’t I think of that? Now I’m going to color mark the style needles before I used them (ink on the shaft) to differentiate the ball points from the universals! This is such a good idea – I’m in. There are definitely a few sewing bad habbits I could sort out like this! I’ve been trying desperately to stop buying new fabric but a certain site, for instance, just put everything on sale for 35 percent. I used to mainly quilt so I have so much quilting fabric and now just as much apparel fabric. I joke that I won’t live to create everything from my fabric, but is that really funny? OK. Just for this month, I will not buy any new fabric. Ready, set, go. Nice and simple! i always try to change everything at once, of course it doesn’t work! Should try to minimize my efforts to 1 thing per month! This is such a good idea! I am awful at all the things you mentioned too, and they can actually make sewing less enjoyable and more stressful! I think the main thing that I would want to focus on would be finishing while I sew (for example semas finishes and snipping loose threads). I always leave this to the last moment and it’s so tedious when I just want to wear my finished garment! Just wanted to say that this concept really does work – I use it in my weight loss goal. I first switched from sweet tea to unsweet then a few weeks later switched from a BBQ to a salad restaurant for lunch on workdays. It really does only take about a month to create that new habit – I had promised myself BBQ for lunch on pay days (once every two weeks) and about a month after the switch found myself at the salad place on payday – totally forgot about my treat to myself! I’ve lost about 10 pounds in about 4 months through lifestyle changes that are maintainable so I have great confidence for success. Wish I could find my dining room table so I could set up my machine & sew again – maybe working toward that should be my next goal? Maybe I could finish that Halloween costume that I started 3 years ago in time for Halloween this year! Even though I’m not currently sewing I love your patterns and the blog is fabulous. The how-to’s are great – both the general ones and the vintage embellishments. Keep up the great work. This is great, I will definitely follow what you post. I have lots of bad habits, don’t we all. This month I will focus on finishing the huge pile of garments which after being cut have sat unfinished for the last two months. what a great idea! I could really use this in my daily life. Now I need to start brainstorming all of my bad habits and ideas on how to tackle them. I’ll definitely be joining you on your monthly habit breaking. I love Zen Habits as well. I am pretty good with keeping my workspace clean. I make it a point to sweep/clean after each project and put things back when I’m finished. However, I am terrible about buying fabric and patterns and not completely finishing projects. I finished a jacket two weeks ago but have yet to work two buttonholes. Why? I have no idea. Thanks for sharing. I look forward to making measurable change with you and everyone else. I am really really bad at prewashing fabric, which I recently just washed my entire stash (that I had set out for current projects). I wish I could eat a salad a day. I don’t like lettuce, which makes eating salad more difficult. Life seems to get overwhelming when you look at your massive to do list. This is just the thing I think everyone could do. Thanks for sharing with us! This strategy reminds me at something we did in a previous workplace. Everybody in the company, from CEO to code monkey to CSR would write some Objectives and Accomplishments in an email every week, and would send it to a public (within the company) mailing list. The idea was to create 5 achievable goals for yourself, and go back at the end of the week to see how you’ve done. I found this so incredibly useful that I’m still using it :) What I particularly like is that it forces you to break everything down into bit-size chunks, no matter how big the project. The one habit that I’d like to tackle first is my scrap hoarding. I really don’t know what it is with these less than 2 square inches of fabric, but I find it really hard to just throw them away. I imagine myself ripping them up and using the them as stuffing (for what??). Or I think I’ll be sewing quilts out of tiny little squares (probably not, though …). So my first goal for the next month shall be that I don’t keep anything that isn’t the size of the quilting block ruler thingy (it’s square, and roughly 10 inches, methinks). This is a really great idea, changing one small thing at a time means you can give it your full attention until it becomes a good habit, rather than trying to do everything at once! I’m quite good at keeping my sewing area tidy, mainly because I don’t have a dedicated sewing area/room, so I use the dining room and have to tidy away when I’m finished. But I am TERRIBLE about changing sewing machine needles. I tend to use the same one for everything! So that will be my habit to change first. I’m also going to try the salad thing. funny–without having an idea of what to call this, I started something similar this past week for myself. I have a tendancy to get so excited about whatever sewing project I’m working on at the moment that I let all other sewing responsibilities fall to the wayside. So my current practice of retraining myself out of this bad habit is that I am cmmitting to complete one “boring” sewing task before I start my fun project for the day. For instance, sew that button back on, or hem the pants real quick. Usually these projects only take10-15 minutes, tops,but it feels SO satisfying to check them off my list…and then I can focus on the good stuff or the rest of the night! I like this strategy. It’s kind of like the advice that you should spend just 5 minutes a day picking up clutter around your house and that small amount of time will give you big results. For me, all the above apply. I’d like to add one thing to the list and that’s getting into the habit of completing one project before moving to another. It’s ok to have two at a time, but I literally have dozens in progress and I never get any of them finished. Count me in as well! I need to get acquire several sewing as well as and non-sewing habits. Stop buying fabric, cleaning the sewing space and putting tools where they belong to, research more on the techniques for a project before starting working on it and not during. Excellent idea! I always try to tackle too much, fail, and get disappointed. Starting small has to work better! I’m going to focus on tidying my sewing space after I’m finished every day. More specifically, I’m going to sweep that dang room’s tile floor every night. Fear me, lint dustbunnies! Tremble, ye tumleweeds of clipped thread! Great idea! and I really need to do something about this crazy obsession of mine. I’m constantly buying fabric and patterns (on sale of course). Yes! New follower t this fantastic blog (and new sewer to your patterns) I’m definitely with you on this one! I’ll start thinking of my first bad habit….competition will be fierce amongst all my bad habits ! haha! I need to start fewer projects and finish more. And I need to go ahead and use up things in my stash that I can’t (directly) replace. Oh goodness I do all of those things except not clipping my threads when I sew. I am almost a little embarrassed to admit that this week was the first time I removed my basting stitches! My first goal will be to finally get rid of those old needles sitting around and scraps that I honestly don’t need. Oof! I hear you about being a messy sewer. I’m definitely down for joining you on this. It’s always easier to make changes if you’ve got company, and I like the idea of picking one thing and working on it for a month. this sounds like something at which i could actually succeed . since i have many bad habits, could this be a longterm feature? A tip for old used sewing needles – I keep an extra needle container that is marked with a piece of green tape – that’s for used-up needles. When it’s full I just pop it in the trash and mark another container. That way I don’t have to worry about someone getting poked. think what a salad is. it’s basically a way to get raw, plant-based foods into your tummy. could you start by slicing a banana into a bowl and dumping in a carton of peach yoghurt? coleslaw is a “salad” as are carrot sticks. a plate of orange slices is a “salad”. i think you see where i’m going with this. i’ve lost 60 pounds! Me? I’d like to organize and print out all my notes of the Vogue Fabrics sewing demos for the past two years. They don’t do me a whole lotta good sitting on my iPhone…so I want to print them out and put them in binders. That’s my biggest resolution..and I daresay that alone will inspire me to new sewing heights. Nothing like rediscovering what you’ve got for renewed mojo. Like now: I found some knitting patterns that I’m going to use for the Ravellenic Games. Going to use cotton yarn I bought more than a year and half ago. I’m completely jazzed. Your idea reminds me of Flylady who uses that principle to clean and declutter your home, add positive health habits and get rid of negative thinking. one of my favorite quotes form her is: ‘you are never behind, just jump in where you are’. Remembering this really helps me when I’m overwhelmed with even starting. We’ve had some real setbacks which had led th a disintegration of things around me. I started cleaning up my sewing/ basement mess now it was summer and honestly so awful that I cried, but bit by bit I’ve been getting things under control and it feels sooo good. It feels great to “Let go and go on’ in life, with old habits, tired routines, ect. Instead of giving up desserts adding salad to life is so refreshing! Great! I’m definitely going to be breaking these habits, too! Great post – and thanks so much for the link, love the site! I think it is a great idea. So we get to learn/be reminded of a new simple skill each month and make it a habit. What’s not to love! Due to illness I have had to be kind to myself and not set big goals and actual it has really worked. Everyday I do one (different) calanetics exercise, one (now two) facial exercises, make and drink a litre of green smoothie (I chop up chunks of veg to snack on during the day while making my smoothie), 20 mins of oil pulling, and my one house-keeping task of the day (rota inspired by Flylady & How Clean is your House). I’ve taken months to add in these habits, and although I don’t have an immaculate home and I don’t have the perfect buff body – yet ;0) – it takes very little time or energy and I have healthy habits for life. This makes so much sense to me…especially because I have not sewn in weeks because I haven’t had a big block of time to devote to it. I love to sew and need to finish all the things I have cut out, but only have snatches of time here and there. So my goal will be to sew for 10 minutes a day…and sew a seam every time I walk by my machine. Love the “lazy” side of this kind of habit changing. Thanks for this post. I am having a red hot go at changing some of my behaviours, specifically organisation and sewing. Today I spent the day cleaning and organising my workspace. By organising my environment I hope that this will help prompt productive habits. Thanks for the small steps tip! Every dull or bent pin or needle will be disposed of in an empty medicine bottle, to be tossed when full. yo-oh! I’m in trouble for myself and my finance too… because I became a sort of shop a holic in the last two year. I collect everything: I have tons of books, patterns, fabrics, precious knitting yarn, embroidery skein,sewing floss, crafts supplies… and can’t stop buying them! this could be a kind of group therapy to a better and more aware purchasing. I’ll work on making sewing an everyday habit. 15 mins of sewing related activity that doesn’t involve internet or books. I’m notorious for getting sidetracked with both. I’ll rephrase that…. no internet, video or books.. I usually shy away from buttons, so this month, when I sew clothes, it has to be WITH buttons!! I love this, I am going to do the cleaning up my mess when I am threw and sew at least 15 minutes a day. It is so much more fun starting in a clean room. I have so many of the same habits as everyone else but I am going to do these first. Where do I sign up? I really want to use the ‘Projects in Progress’ storage area that I put in when I was re-organizing my craft area. This means the projects won’t be scattered all over the table, and I can easily sit down to work on what I want to work on. Simply putting the project in the bin, pushing my machine to the back of the table, will make the area much more generally useful. Love this idea! Thanks for the inspiration! P.S. Salad every day?!? Amazing. Any tips or recipes? I am guilty of all of those things. I’ve been getting better about snipping threads though. I’ve started keeping a little thread trash bag taped to my desk for the sake of my cats since snippets pointed out how my kitties might be eating my thread. 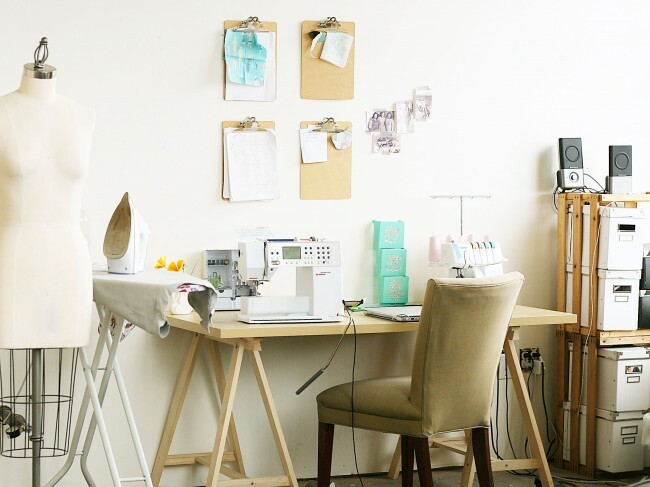 Lovely post on sewing habits. I do hoard fabric and do not throw scraps away in the hope of using them one day. Love your idea of linking buying with making and thus balancing it out. On creating habits, I’d highly recommend BJ Fogg, a Stanford University innovator, social scientist and teacher, who is doing some revealing research on creating habits. And it doesn’t take 20 days or a month to create a habit. It takes as less as a two days at times. http://www.bjfogg.com/ I took his free 3 tiny habits program and it works. In the last week, I’ve started three new habits and they’ve stuck effortlessly. Interesting, I’m familiar with his work at the Stanford Persuasion Lab from my grad school days. I’ll be sure to take a look at this. Great. :) Would love to know how 3 habits worked for you. I’m lovin it! Bad habit: Listen clearly to others. Sewing Habit: Make a pattern out of all those clothes I’ve stuffed into a bag. Definitely a good time to commit with the holiday madness approaching.